I realized after reading Terrance Jones blog on using bicycles as advertising that I had quite a collection of bicycle photos. Why are we intrigued with shooting bicycles? I think it has to do with the shapes and colors they come in. Enjoy the collection I am going to share with you. The above photo was taken at Shady Trails Family Campground in Hillsboro Ohio. It sits at the entrance to one of the trails on the property. It has the colorful silk flowers in the basket on the front and the saddlebags on the back. It has been a fixture at the campground for as long as I’ve been there (at least 7 years). 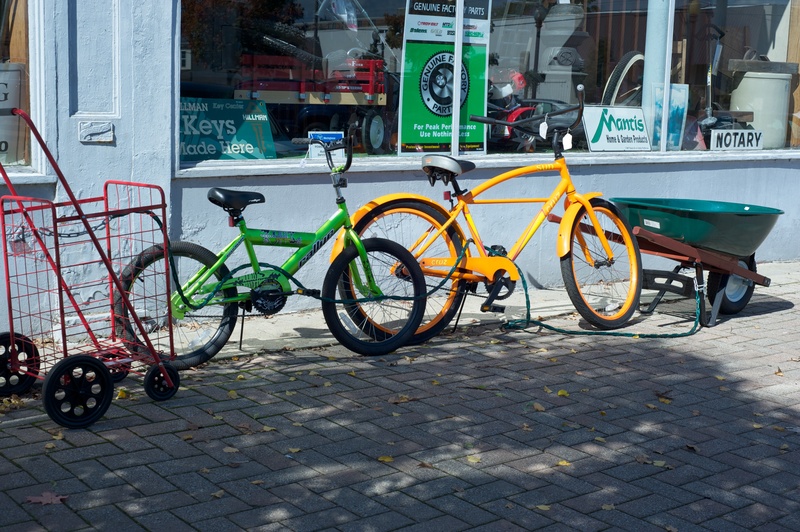 These two bikes were on display outside the hardware store on Market Street in Portsmouth Ohio. The bright colors caught my eye. The above bike is also located on Market Street in Portsmouth Ohio, in front of the Market Street Cafe. It is a Huffy and I liked the fact that it was rusted and the wheels are flat! Not exactly “road ready”. This bike is suspended above a bicycle shop in Chillicothe Ohio. It causes images of ET to flow through my mind. The above bikes were seen at the Wheelersburg Ohio Flea Market in 2010. I loved the colors and how the vendor had them lined up at his “booth”. 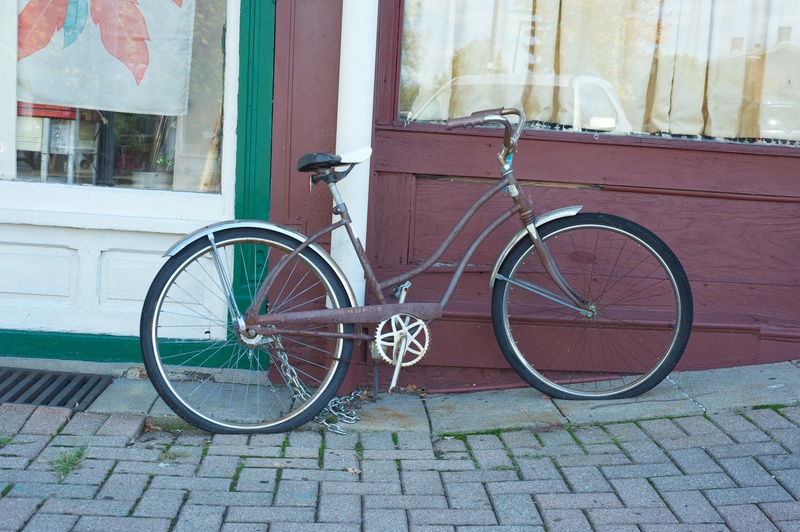 This bicycle is located on Second Street in Portsmouth Ohio and is decorated for fall. 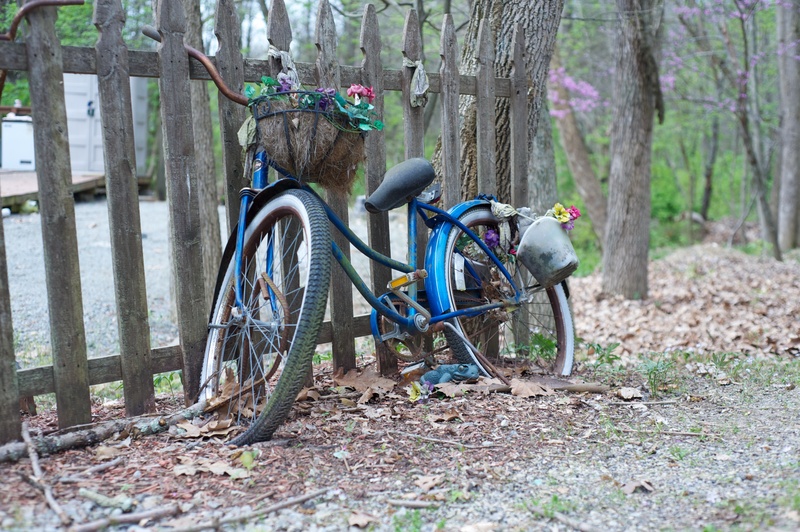 I like how people are “re-purposing” these old bikes and using them as decorations. 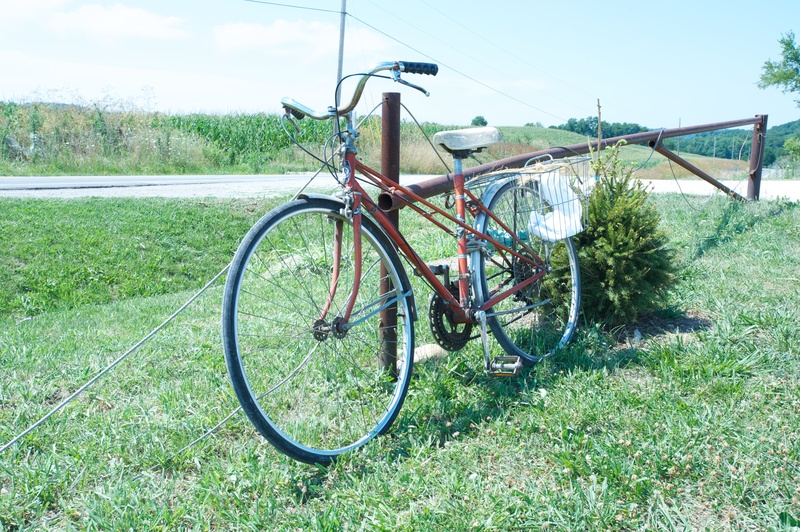 Last, but not least, this is a bike that is used by the Amish in Bainbridge Ohio. It was parked outside the produce market there. I hope you enjoy viewing this photos as much as I enjoyed taking them. I am sure I will take more pictures of bicycles as time goes on. It is such a simple yet efficient mode of transportation and it makes for a nice “center piece” for your shop or yard. I was at the bank today and the sun was out and there were nice white fluffy clouds in the sky. 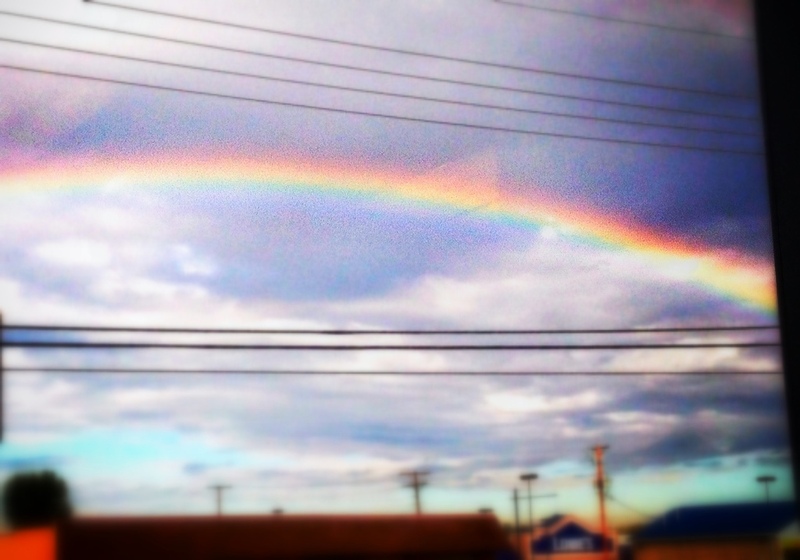 I was talking with the customer service assistant and looked out the window and saw this beautiful rainbow. It extended from the river over to roughly Sciotoville. The best I could do at the time was photograph it with my iPhone through the tinted window of the bank. I started to get up and go out to shoot it outside, but it disappeared as quickly as it came. It was colorful and sharp. What a wonderful scene to see today. 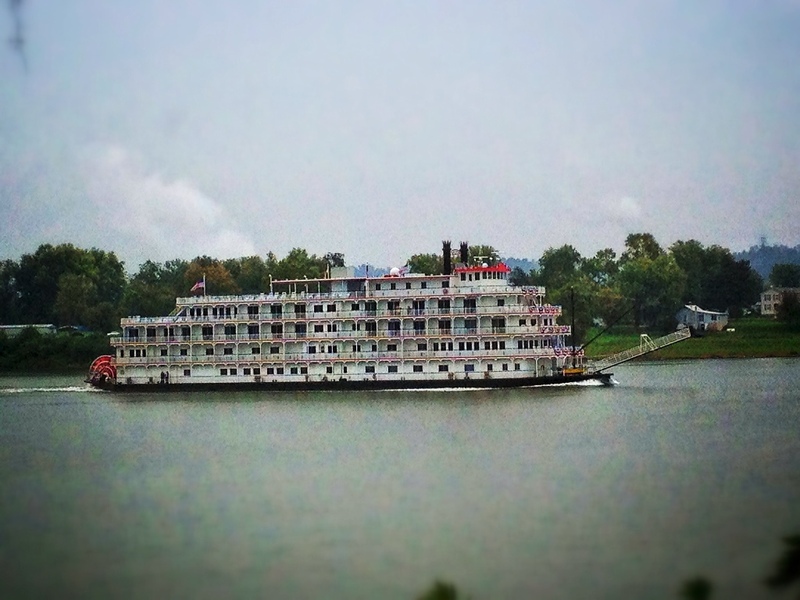 Today I was pleasantly surprised by seeing this magnificent paddle wheel boat traveling along the Ohio River. I was on my way home from Flatwoods Kentucky traveling west along route 23 toward the Greenup Dam. I had already passed through Greenup when I spotted this beauty. I turned my car around (safely!) and went back to Greenup to find a spot that I could get a clear view of the boat. I circled the courthouse as they were bringing inmates out, thinking, do I really want to be in this area? I tried to find a place to park only to find the parking spaces were reserved for the dignitaries of the courthouse. I finally found a public parking space and parked between two sheriff cruisers! I ran to an opening in the trees overlooking the river just in time to capture a few shots with my iPhone…while standing in the rain! The riverboat did not have a name on the side I saw and I did not see a name on the back. This was a special treat today! I found out today that this is the Queen of the Mississippi. This is her maiden voyage and it is a new paddle wheel boat and she is 4 months old!